Indie Mag is a global magazine for independent musicians. Each issue is filled with interviews and features – from indie innovators to acclaimed songwriters, from producers to managers, from up-and-coming artists to label owners. It’s all about spotlighting the best independent musicians around the world and celebrating them. 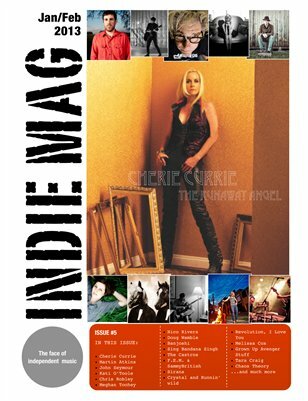 In our Jan/Feb 2013 issue, we talk to Cherie Currie (The Runaways), Martin Atkins (PiL, Pigface, Nine Inch Nails), John Seymour (Engineer/Producer: Dave Matthews Band, Alice In Chains), Chris Robley, Meghan Toohey, Kati O'Toole and many more.